With her classic performance in Dostana and Fashion, it seems this cute lady and Miss India/Universe? (kindly check) is going places, splashing her colours all around and painting the town wild. Ganesha looks into her near future, till her birthday. Notice that Guru the lord of her ninth house of bhagya and luck will be debilitated and in conjcuntion with transiting Rahu. Transiting Guru and Rahu are trine to natal Shani, the lord of the seventh house of public acclaim and fame. 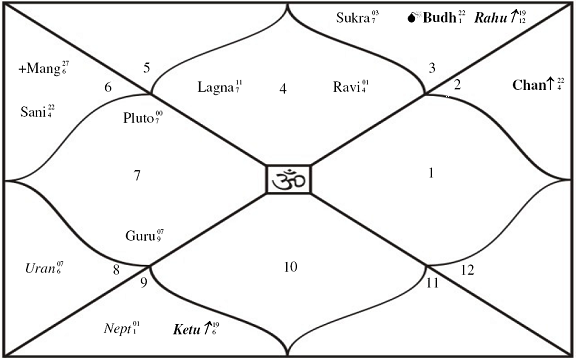 Transiting Guru and Rahu are trine to natal Mangal the lord of her tenth house of career. 11 November 2008 – 15 December 2008, possibly a contact will be terminated. 22 November 2008 – 2 December 2008, this is also a trying time, but she may get a couple of films here and offered some good roles and characters. 12 December 2008 – 28 December 2008, any films released now may meet with good success and she will again be praised for her work. She will be acknowledged and acclaimed. Love issues may also be difficult to handle and she may face problems in relationship matters. 7 January 2009 – 17 January 2009, results of labour and hard work, are up for fruition and plucking now. She seems to roll in fame and glory, may be win some or the other award, or be at least considered for the same, she may even get some good and high profile assignments to host an event or something and also do not forget that films released in this period will also do well. 17 January 2009 – 22 February 2009, this is not an easy time. She is likely to stay in hospital. Her relationships will be tested at this time and possibly be terminated. She may face criticism too from some quarters who are jealous of her, or on the other hand, her success may get into her and she may make statements which may invite trouble. 25 January 2009 – 2 February 2009, During this period her personal and professional relationships may take a noticeable turn for the better. She may get some new offers too which may be good for her in the long run. It could also be the time for taking some marriage decisions too, so look out. 1 March 2009 – 24 March 2009, is one of the best periods for making contact with people, both for social or professional reasons. Marriage decisions too are possible here or she may make some other important decision regarding her relations, if she does not decide on marriage. Again new releases in this period will bring her more accolades. 17 March 2009 – 22 April 2009, professionally a very tough time, where she may be pulled away from the glam and glory that she was basking in till now. Its best that her films are not released now. 8 April 2009 – 20 April 2009, this is an excellent period for staring a new film, taking up and signing new projects. Even if her films are released in this period, they may achieve above average success.